8 Canada Square (also known as the HSBC Tower) is a skyscraper in Canary Wharf, London. 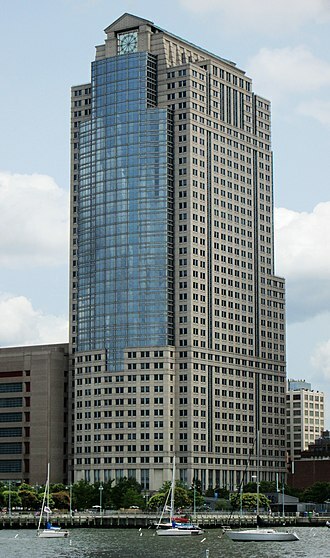 The building serves as the global headquarters of the HSBC Group. With the movement of HSBC Group's headquarters from Hong Kong to London in 1993, the firm decided that having thousands of employees scattered across the City of London was not an ideal situation. Between 1995 and 1997 a number of proposals were considered, including the redevelopment of the previous Group Head Office at 10 Lower Thames Street, London. 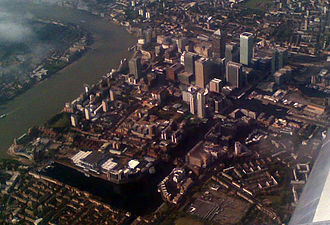 However the DS-2 plot at Canary Wharf was chosen for the location and space available. Having been commissioned by the owners of the Canary Wharf Site to do the outline design prior to gaining site-wide outline planning permission, and because he had designed HSBC's last head office at 1 Queen's Road, Central, Hong Kong Island, Hong Kong, Sir Norman Foster (now Lord Foster of Thames Bank) was appointed as architect. 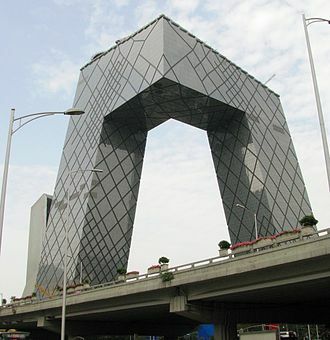 Arup became structural engineers for the project, and Davis Langdon & Everest (now Davis Langdon) quantity surveyors. Construction began in January 1999, with work beginning on the installation of the 4,900 glass panels commencing in summer 2000. 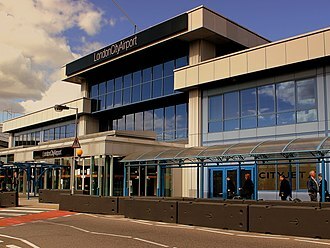 The work was carried out by Canary Wharf Contractors. In May 2000, three workmen were killed in a crane accident. The topping out ceremony took place on 7 March 2001, with the hoisting in of the final steel girder attended by bankers, journalists and contractors. The first HSBC employees began work in the building on 2 September 2002, with phased occupation completed by 17 February 2003, and the building's official opening, by Sir John Bond, taking place on 2 April 2003. Standing nearby the HSBC Tower are One Canada Square (popularly known as the Canary Wharf Tower); and the Citigroup Centre, which forms the British head office of the multinational US bank, Citigroup. It is also next door to Bank of America. The tower is not open to the public. Counting from its official opening in April 2003, it was only four years before difficulties emerged in managing the building and its associated costs. In April 2007, HSBC Tower was sold to Spanish property company Metrovacesa, becoming the first building in Britain to be sold for more than £1bn. On 5 December 2008, HSBC Holdings re-acquired ownership of the building, declaring that the agreement had resulted in a £250 million ($368 million) profit in the second half of the year. However, on 13 November 2009, HSBC once again sold the building, this time to the National Pension Service ("NPS"), the public pension fund for South Korea, for £772.5 million. HSBC's income statement on completion declared a gain of approximately £350million resulting from the transaction, which was finalised shortly before the end of the year 2009. In December 2014, Qatar Investment Authority, completed the purchase of this building at an undisclosed price, but the building was expected to fetch more than £1.1 billion (US$1.73 billion). NPS was advised by the estate agents Jones Lang LaSalle and GM Real Estate. In line with HSBC's environmental principles energy efficient systems like Telelift document and mail conveying system have been installed from the outset, along with recyclable furniture and equipment. A competition was held to select a feature for the ground floor lobby, unveiled by the then Group Chief Executive Sir Keith Whitson, the HSBC History Wall includes history, achievements and values of the Group from the 18th to 21st centuries. The wall is 6.6 metres (22 ft) tall, with 3,743 images, including documents, photographs, portraits and illustrations of staff, buildings, businesses and events. The wall was manufactured and installed by Supersine Duramark (SSDM) – a company specialising in commercial graphics and large-format printing in the United Kingdom. 8 Canada Square has a pair of bronze lions guarding the main entrance. These are copies of a pair nicknamed "Stephen" and "Stitt" which have stood outside the Bank's Headquarters at 1 Queen's Road Central in Hong Kong since 1935. The Hong Kong lions are named after yet another pair of lions that guarded the Bank's Shanghai headquarters on The Bund after it opened in 1923. The original Stephen and Stitt were named for A G Stephen, the then Chief Manager and the driving force behind the Shanghai development, and G H Stitt, the Manager in Shanghai. This was an in-joke: The lions face each other, and one (Stephen) is portrayed as if roaring, the other sitting quietly. Messrs Stephen and Stitt were said to have personalities as diverse. The lions were cast within sight of the development by the Bronze Age Sculpture Casting Foundry in Limehouse. Office space — 102,190 square metres (1,100,000 sq ft). Floors – 42 above ground. Staff restaurant – 850 seater facility is the largest of its kind in Europe, serving around 2,500 meals daily. Glass – 45,000 square metres or 484,200 square feet (44,980 m2). The nearest tube station is Canary Wharf serving the Jubilee line, which can be reached undercover via Canada Place shopping centre, and Canary Wharf DLR station serving the Docklands Light Railway. 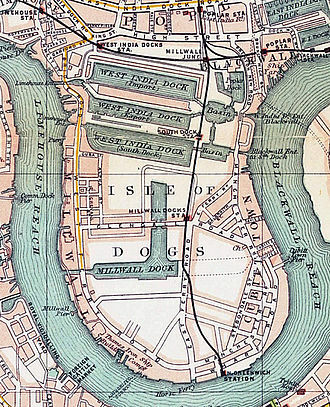 A bus service used to run to London City Airport, now replaced by the Docklands Light Railway. ^ "8 Canada Square". Skyscraper Center. CTBUH. Retrieved 13 October 2017. ^ Treanor, Jill (15 February 2016). 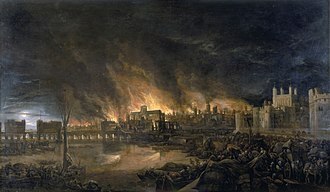 "HSBC to keep its headquarters in London". the Guardian. Retrieved 31 July 2018. ^ "HSBC Tower, London". OpenBuildings. Retrieved 30 August 2017. ^ "Projects – HSBC UK Headquarters – London, UK – 1997–2002". Foster + Partners. Retrieved 3 January 2014. ^ "Crane crash trio named". BBC News. 22 May 2000. Retrieved 3 January 2014. ^ SkyscraperNews.com (April 2007). "HSBC Tower Sold For Record Price". SkyscraperNews.com. Retrieved 5 May 2007. ^ Wall Street Journal (15 December 2014). "Qatar Fund Buys HSBC's London Headquarters". The Wall Street Journal. Retrieved 5 January 2015. ^ Financial Times (24 April 2014). "Sale of HSBC tower hints at return to property boom times". The Financial Times. Retrieved 5 January 2015. ^ Euro Property (25 September 2014). "Middle Eastern investor to buy £1.1bn London skyscraper". Euro Property. Retrieved 5 January 2015. ^ http://www.bronzeage.co.uk Bronze Age Sculpture Casting Foundry in Limehouse. Wikimedia Commons has media related to 8 Canada Square. The Citigroup Centre is a building complex in London. 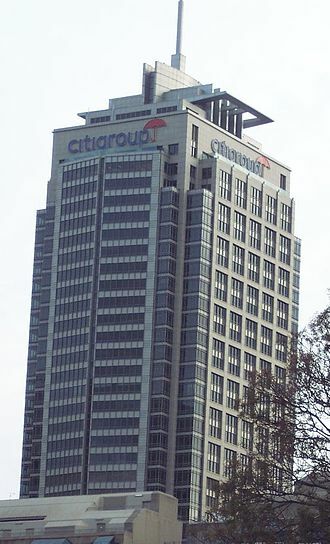 It houses Citigroups EMEA headquarters and is located in Canary Wharf in the citys Docklands, the centre provides 170,000 square metres of floor space across two merged buildings -33 Canada Square and 25 Canada Square, and houses the bulk of Citis UK employee base. 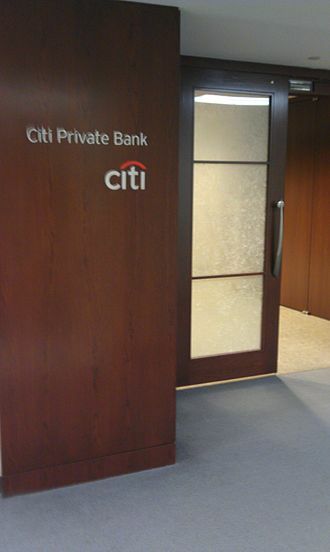 Together, both form the Citigroup Centre complex. 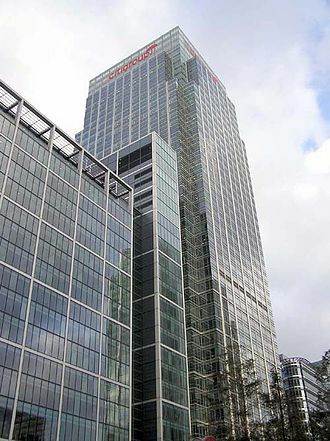 25 Canada Square, or Citigroup Centre 2, stands at 200 metres and, the building was bought by RBS in 2004 along with 5 Canada Square for $1.12 billion. Subsequently, on 2 July 2007, CGC2 was individually sold to a joint venture between Quinlan Private and PropInvest for £1 billion, Citigroup pay £46.5 million a year in rent for the tower, generating a yield of 4. 6% to the owners. The east facing side of 25 Canada Square up to level 40 is configured for use by tenants. 33 Canada Square, or Citigroup Centre 1, is the smaller of the two buildings in the complex, designed by Norman Foster and completed in 1999, two years before its neighbour. The documentary released by CCTV, directed by Zhou Bing. The Bund or Waitan is a waterfront area in central Shanghai, the area centers on a section of Zhongshan Road within the former Shanghai International Settlement, which runs along the western bank of the Huangpu River in the eastern part of Huangpu District. The area along the faces the modern skyscrapers of Lujiazui in the Pudong District. 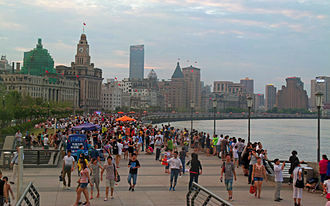 The Bund usually refers to the buildings and wharves on this section of the road and it is one of the most famous tourist destinations in Shanghai. 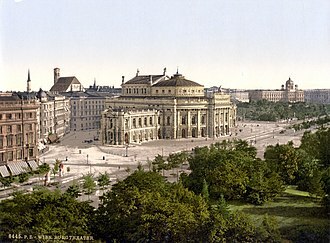 Building heights are restricted in the area, the word bund means an embankment or an embanked quay. The word comes from the Persian word band, through Hindustani, meaning an embankment, mumbais Apollo Bunder and city names like Bandar Abbas and Banda Aceh share the same etymology. In these Chinese port cities, the English term came to mean, especially, in English, Bund is pronounced to rhyme with fund. There are numerous sites in India and Japan that are called bunds, The Bund, without qualification to location, usually refers to this stretch of embanked riverfront in Shanghai. The Bund lies north of the old, walled city of Shanghai and it was initially a British settlement, the British and American settlements were combined in the International Settlement. Magnificent commercial buildings in the Beaux Arts style sprung up in the years around the turn of the 20th century as the Bund developed into a financial center of east Asia. Directly to the south, and just northeast of the old walled city, by the 1940s, the Bund housed the headquarters of many, if not most, of the major financial institutions operating in China, including the big four national banks in the Republic of China era. However, with the Communist victory in the Chinese civil war, many of the institutions were moved out gradually in the 1950s. 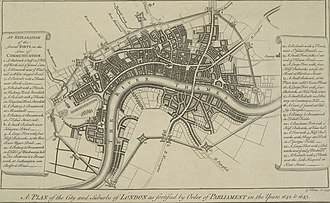 The statues of figures and foreign worthies which had dotted the riverside were removed. In the late 1970s and early 1980s, with the thawing of economic policy in the Peoples Republic of China, government institutions were moved out in favour of financial institutions, while hotels resumed trading as such. Canary Wharf is a London Underground station on the Jubilee line, between Canada Water and North Greenwich. The station, serving Canary Wharf, is in Travelcard Zone 2 and was opened by Ken Livingstone setting an escalator in motion on 17 September 1999 as part of the Jubilee Line Extension and it is maintained by Tube Lines. Before the arrival of the Jubilee line, Londons Docklands had suffered from relatively poor public transport, although the Docklands Light Railway station at Canary Wharf had been operating since 1987, by 1990 it was obvious that the DLRs capacity would soon be reached. The Jubilee lines routing through Canary Wharf was intended to relieve some of this pressure, the tube station was intended from the start to be the showpiece of the Jubilee Line Extension, and the contract for its design was awarded in 1990 to the renowned architect Sir Norman Foster. 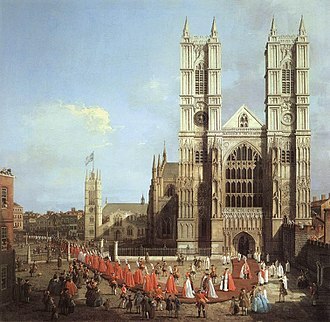 The size of the interior has led to it being compared to a cathedral, the main reason for the stations enormous dimensions was the great number of passengers predicted, as many as 50,000 daily. These predictions have been outgrown, with as many as 69,759 on weekdays recorded in 2006, in a 2013 poll conducted by YouGov, it was voted as the Most Loved tube station in London. Above ground there is sign of the vast interior, two curved glass canopies at the east and west ends of the station cover the entrances. The Jubilee Park, a park is situated between the two canopies, above the station concourse. As with the other stations on the Jubilee Line extension. Canary Wharf station has one of the busiest stations on the network. 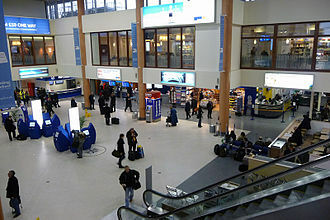 Although it shares its name with the Docklands Light Railway station at Canary Wharf, all three stations are connected underground via shopping malls. Out-of-station interchange within twenty minutes between any two of the stations entails no additional charge, Canary Wharf can be used to reverse trains from both the east and the west. The station is located on the Jubilee line between Canada Water and North Greenwich in Travelcard Zone 2, trains run every 10 minutes on the entire line. Citigroup Inc. or Citi is an American multinational investment banking and financial services corporation headquartered in Manhattan, New York City. The company was formed by the merger of banking giant Citicorp, Citigroup ranks 3rd on the list of largest banks in the United States by assets and is one of the Big Four banks in the United States, alongside JPMorgan Chase, Bank of America, and Wells Fargo. In addition to U. S. money managers, its largest shareholders include Abu Dhabi, Prince Al-Waleed bin Talal, the company is one of 24 primary dealers in United States Treasury securities. Citigroup has over 200 million customer accounts and does business in more than 160 countries, Citigroup has 219,000 employees, although it had 357,000 employees at its height before the financial crisis of 2007-2008. Citigroup suffered huge losses during the crisis of 2007-2008 and was rescued in November 2008 in a massive stimulus package by the U. S. government. Citigroup was formed on October 9,1998, following the $140 billion merger of Citicorp and Travelers Group to create the worlds largest financial services organization. As such, the history dates back to the founding of. City Bank of New York was chartered by New York State on June 16,1812, serving a group of New York merchants, the bank opened for business on September 14 of that year, and Samuel Osgood was elected as the first President of the company. The companys name was changed to The National City Bank of New York in 1865 after it joined the new U. S. national banking system, and it became the largest American bank by 1895. The bank changed its name to The First National City Bank of New York in 1955, the bank introduced its First National City Charge Service credit card—popularly known as the Everything card and to become MasterCard—in 1967. In 1976, under the leadership of CEO Walter B, First National City Bank was renamed as Citibank, N. A. Shortly afterward, the bank launched the Citicard, which pioneered the use of 24-hour ATMs, john S. Reed was elected CEO in 1984, and Citi became a founding member of the CHAPS clearing house in London. Travelers Group, at the time of merger, was a group of financial concerns that had been brought together under CEO Sandy Weill. Canary Wharf is a Docklands Light Railway station in Canary Wharf on the Isle of Dogs in Greater London, England. The station was built into the base of One Canada Square itself, the station itself has six platforms serving three rail tracks and is sheltered by a distinctive elliptical glass roof. 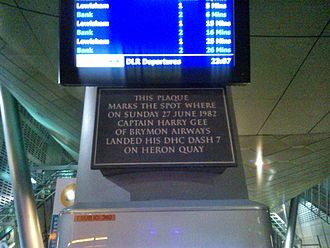 The station is located on the DLR between Heron Quays station and West India Quay station, which are in fact the three closest railway stations on the line in the world. The station is shown on the Tube map as being within walking distance of Canary Wharf tube station, Canary Wharf station had been part of the original DLR plans, but when the system opened in August 1987 the station was not ready. It was originally planned that the station would be similar to the station at Heron Quays. It soon became apparent that the Canary Wharf development would produce demand well above the capacity of a simple station, on 17 July 1987 a contract was awarded to GEC-Mowlem Railway Group to rebuild the station into the considerably more elaborate and spacious design that exists today. The HSBC Building is a six-floor neo-classical building in the Bund area of Shanghai, China. It served as the headquarters of the Shanghai branch of The Hongkong and Shanghai Banking Corporation from 1923 to 1955, the building is situated at number 12, the Bund. Designed by the British architecture firm Palmer & Turner Architects and Surveyors, the HSBC Building has been called the most luxurious building from the Suez Canal to the Bering Strait. The building has an area of 23,415 m², and was, at the time, the largest bank building in the Far East. The building exterior adopted a strict neo-classicist design, with a vertical and horizontal division. In the centre is a dome, the base decorated with a structure in imitation of Greek temples. Below that are six Ionic columns penetrating from the second to the fourth storey, the main structure is five storeys, the central section seven storeys, with one and a half storey for the basement. The main structure has a lattice with brick filling. The interior was decorated, using materials such as marble. The HSBC lions have become distinctive landmarks in their own right in Hong Kong and Shanghai respectively, with a further pair to be found in London. The first set of sculptures were commissioned for the rebuilt HSBC Building on the Bund in Shanghai. They became known as Stephen and Stitt, an in-joke, Stephen was named for A G Stephen, formerly Manager Shanghai, and in 1923 the Chief Manager of HSBC, and G H Stitt, the Manager Shanghai. Stephen is depicted roaring, Stitt quiescent, and again said that this represented the characters of these two famous bankers. When HSBC decided to build its third Headquarters at 1 Queens Road Central in Hong Kong, opened in 1935, it commissioned two bronze lions from Shanghai-based British sculptor WW Wagstaff. This commission was inspired by the earlier lions commissioned for the Shanghai office, and the Hong Kong lions were modelled on, but are not identical to, hunch-backed, Wagstaff was nicknamed Lao Doo Pei, meaning Old Hunchback. His son, was called Sau Doo Pei – Young Hunchback, Wagstaff had two sons – Don, killed in Naval service in the war, and Alex, killed while interned in Shanghai by the Japanese. Chou Yin Hsiang himself came to Hong Kong in 1935, and by 1977 was the proprietor of Jeh Hsing Metal Works –, like the Shanghai lions, the Hong Kong lions became objects of veneration, and focii of the Banks perceived excellent feng shui. Young couples still bring their toddlers to stroke the paws and noses of the hoping for luck. When the 1935 building closed its doors for the last time on 26 June 1981, demolition, by China Swiss Engineers, started on 6 July 1981. The lions were moved on 4 June 1982 to Statue Square. Luckily the war ended before this could happen, and the lions were recognised by an American sailor in a dockyard in Osaka in 1945 and they were returned a few months and restored to their original positions in October 1946. The Hong Kong lions are called Stephen and Stitt, after the re-organisation of the HSBC business into the present-day HSBC Group, the Groups headquarters were placed in London. The new headquarters building, located at 8 Canada Square, in the Canary Wharf development of the Isle of Dogs in London, a pair of lions were again commissioned for the new headquarters. The second design of the HSBC headquarters building, used from 1886 to 1933. Elevation of the HSBC Building in Shanghai, showing the placement of the lions by the main doors. Shrapnel damage from the 1941 Battle of Hong Kong. The HSBC building in Canary Wharf, London, owned by Metrovacesa from 2007 to 2008. Las Arenas, a mall in Barcelona developed by Metrovacesa (2013).